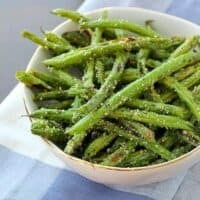 These roasted green beans with parmesan and basil are crispy, flavorful and probably don’t even require a trip to the store — just open your pantry and fridge! I don’t know if I’ve ever seen my mom enjoy a food as much as she enjoyed these roasted green beans! Okay that might be an exaggeration, but my mom LOVED these little suckers. I had cranked out a bunch of recipes the day before she visited last time and I got these out with dinner the night she and my dad arrived. They were slightly soggy by that point and I lazily reheated them in the microwave, making them even soggier. But she couldn’t stop eating them! She’s probably annoyed that it took me so long to post the recipe. I love cooking with my mom and she is the one who gave me the love of cooking so anytime I knock a recipe out of the park in her eyes, I feel an extra sense of accomplishment and success. And to be honest, I wasn’t really sure these roasted green beans with parmesan were going to be all that. I was a little embarrassed to be using grated parmesan cheese (we’re talking green can!) and dried basil. Should I be using freshly grated parmesan and basil leaves picked from my (non-existent) garden? Perhaps, but perhaps not. Sometimes what you have on hand is more than good enough. Sometimes it’s great! Sometimes it will have your mom talking about green beans for a week. Plus, Rachel Cooks is all about E-A-S-Y (If you love that, you’ll love all my recipes — click here to get them free in your inbox as soon as they’re published here — you’ll also get a free ebook). I don’t want you to have to run to the store if you don’t have to. 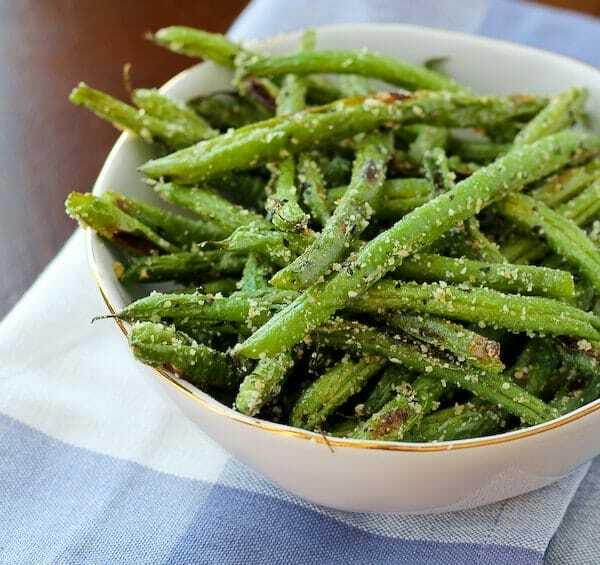 And you totally don’t have to because these green beans rock just as they are. 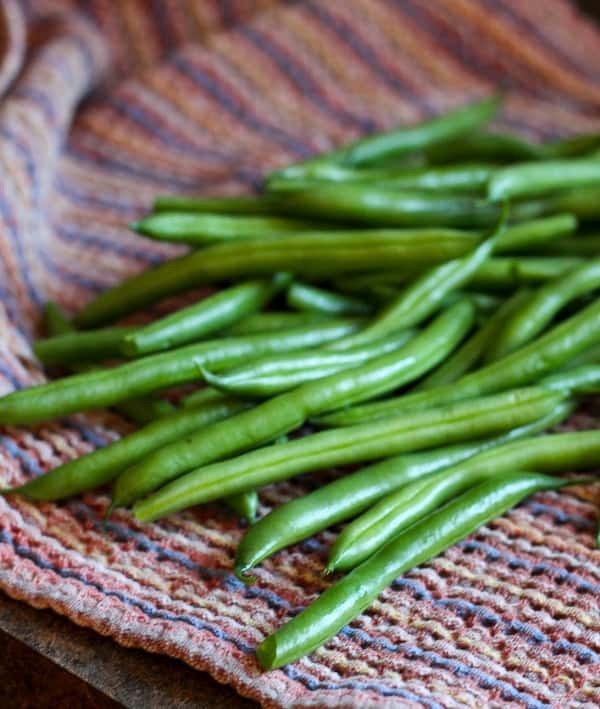 One thing I would mention is to make sure to dry your green beans really well. This is true when you’re roasting any vegetable and green beans are no exception. I put them right onto a towel and rolled them around a bit until they were nice and dry. Then you can get to roasting. If basil and parmesan aren’t for you, make sure to try the green beans with lemon and feta that I posted a couple of weeks ago. 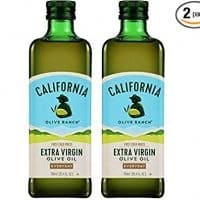 I prefer those, my mom prefers these. Try them both! Or if you’re in the mood for something a bit richer, try my homemade green bean casserole – no canned soup in this version! Dry green beans well and spread on a rimmed baking sheet. Toss with olive oil (use your hands), so that all the beans are coated. Sprinkle with salt, pepper, basil. Toss again to coat. Roast for 10 minutes, toss, and continue to roast for 5 more minutes. Immediately sprinkle with parmesan and serve. These would be amazing with fresh basil instead of dried (but they’re amazing as is, too!). If you have it, leave off the basil before roasting. Wait until after they are cooked and then toss with the finely minced basil leaves. 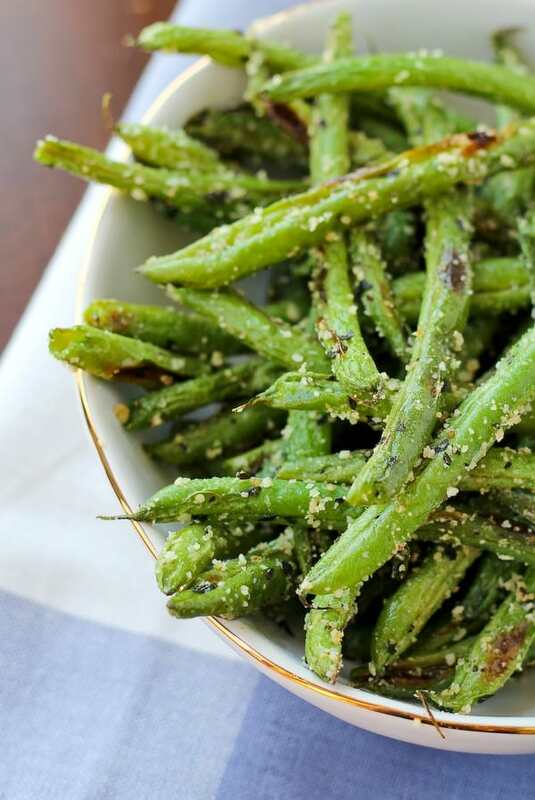 Verdict: These roasted green beans with Parmesan are almost as good as french fries. Okay, no, nothing like french fries. But good on their own merits! Totally different than french fries but just as good. Where was I going with this? 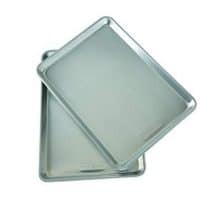 Husband’s take: As you know, these were a hit with my mom. No one else had any complaints at all either! PS: Love roasting vegetables as much as I do? I compiled all my roasted vegetables into one giant list! You’ll find the basics there, but you’ll also find jazzed up versions, sheet pan dinners, and a few things that are roasted but aren’t vegetables. One of my favorites are these cumin roasted carrots. 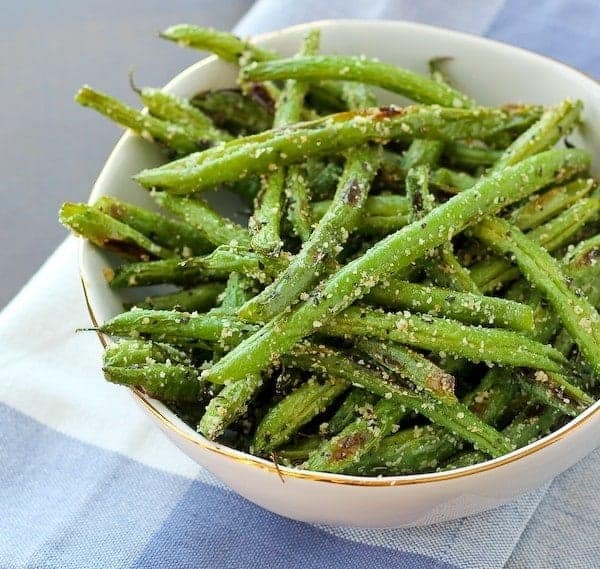 If you love these roasted green beans, I know you’re going to love this list!